Springtime is a time for brightening the day of those you love. 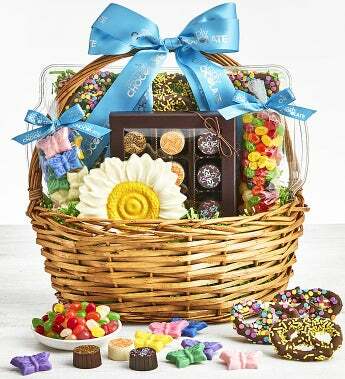 This beautiful wicker basket of gourmet goodies will really impress and delight all chocolate & sweets lovers. This exclusive gift is brimming with snack favorites including pastel confetti decorated chocolate pretzels, assorted artisan chocolate truffles, spring jelly eggs, and a white chocolate spring flower and butterflies. Gift measures 14" x 14" x 12"